The Eighth Judicial District Commission on Judicial Performance unanimously (9 ayes and 1 absent) recommends that Judge Thomas L. Lynch BE RETAINED. Judge Lynch was appointed to the County Court in December 2010. Prior to his appointment, Judge Lynch was a Deputy District Attorney at the District Attorney’s Office of the 8th Judicial District. 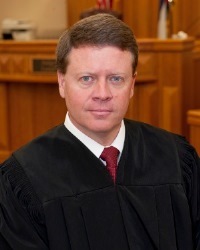 Judge Lynch received his Bachelor of Science Degree in Computer Science and Juris Doctorate Degree from the University of Wyoming. Judge Lynch has presented legal programs at the high school and college levels. He has served as a judge at the High School Mock Trial Tournament and other speech and debate competitions. The Commission conducted a personal interview with Judge Lynch, reviewed opinions he authored, observed him in court, heard comments from the District Attorney’s Office and reviewed surveys sent to attorneys and non-attorneys. When comparing the survey results of Judge Lynch with other Colorado County Court Judges, his scores are above the average of all other County Court Judges surveyed. This includes the areas of case management, application and knowledge of law, communication, demeanor and diligence. Among the survey questions was “how strongly do you recommend that Judge Lynch be retained in office, or not be retained in office?” Of attorneys responding to the survey, 92% recommended to retain, 4% not to retain, and 4% made no recommendation regarding retention. Of non-attorneys responding to the survey, 91% recommended to retain, 5% not to retain, and 4% made no recommendation regarding retention. Judge Lynch’s docket consists of 62% civil cases, 20% misdemeanor criminal cases, and 18% traffic cases. The prevailing comments from the surveys indicate that Judge Lynch is organized and patient; has an excellent demeanor; is fair, impartial and diligent. Judge Lynch carefully explains the courtroom process to the parties appearing in front of him, including pro se litigants. Judge Lynch seeks to administer his courtroom more efficiently, while affording litigants the opportunity to be fully heard. Judge Lynch enjoys his job, the people he works with and the people who come before him. The Commission finds Judge Lynch a thoughtful and conscientious Judge.